The Rise of the Runelords Adventure Path concludes! The Runelord of Greed, Karzoug the Claimer, stirs in the legendary city of Xin-Shalast. There are more forces than an ancient evil wizard at work in this remote corner of Golarion, a place where the boundaries between reality and nightmare are unnaturally thin. Karzoug's minions have awakened as well, among them giants and dragons and devils and worse. Could there be an even deeper evil poised to emerge from the darkness at the dawn of time? Can the Rise of the Runelords be stopped? "Spires of Xin-Shalast," an adventure for 14th-level characters, by Greg A. Vaughan. Full details on Karzoug, the Runelord of Greed, by Greg A. Vaughan. Expanded rules for adventuring in high-altitude environments (beware those abominable snowmen! ), by Greg A. Vaughan. The sixth installment of the Pathfinder's Journal, by James L. Sutter. Seven new monsters, by Greg A. Vaughan. - Xin-Shalast is fully detailed (1/3 of the book) : I had the strong impression to read a city book guide (something between a whole book like the Guide of Korvosa and a single entry from Cities of Golarion) + an high level sandboxing scenario in the same time. It pleasantly surprised me. - Not a real drawback but the side articles are really small (3 pages each without the title pages) because of the Xin-Shalast big description. Rise of the Runelords terminou com um final digno e épico. A aventura final é um tratado de como conduzir aventuras de nível elevado em D&D. A campanha como um todo teve seus altos e baixos, mas de certa forma merece sua enorme popularidade entre os fãs (não é minha preferida, mas está no meu top 5), que gerou uma enorme lista de discussão que até hoje trocam mensagens discutindo atualizações para outros sistemas, erratas e formas de se conduzir cada minima parte dela. Spires of Xin-Shalast é o resultado de todo esse trabalho e mesmo assim ainda funciona muito bem individualmente. Um clássico que eu tenho muito orgulho de ter em minha biblioteca e que certamente figurará entre as melhores aventuras de todos os tempos. I had to shorten everything because most of my players don't like high level play, we take very long for every fight and campaign exhaustion had kicked in, everyone knew that it was the last part and all of them where planing new PC's and where exited to play them as soon as possible. The giant meat-grinder was quite fun and not as exhausting as I had feared, the two ladies put up quit a fight but the apprentice was unremarkable. This adventure has everything I like, dungeon crawling, cave lurking, city walking, arena fighting, mountaing climbing, dragon slaying, fey-sighting and more! The only thing it lacks its heavy roleplaying or social interaction with other characters (at least live-non-monster characters), but at this point that way past due. Also after you finish the adventure you have a whole city to continue exploring! There's also plenty of material you can expand to beef up your PCs up to higher levels if you want Karzoug to be even nastier. A great 5 start sweetness! I see that by Spires of Xin-Shalast, the PC's should be around 15th level. Will chapter 2 "Curse of the Crimsom Throne" be assumed to start at the same time in the same world? Does chapter 2 assume you will create new level 1 characters? If so, how adaptable is the plot so you could continue with your characters that finished chapter 1 "Rise of the Runelords"? I don't think that they announced the level range of the second AP. But I'd expect it to take up 15-20 levels, which would mean this AP would start with PCs at 1st to 6th. IMHO, That would be very difficult to modify for 15th or 16th level characters. Oh, and this AP will probably cover levels 1–15. Could go higher or lower. We're still working out those gory details. Is anyone else excessively excited for this one? An ancient city with the stylings of the Runelord of Greed, fully detailed and taking up pretty much an entire volume? 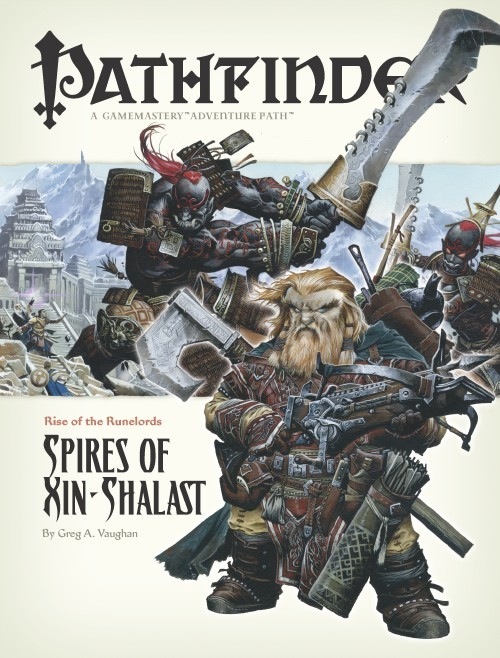 If Paizo's past efforts at this sort of thing are any indication of how cool Xin-Shalast will be, having a whole volume for them to detail ought to inspire a lot more beyond capping off the first Pathfinder AP. Hope this one becomes a classic! Think of all the treasure! Mountains and mounds of gold! And everyone remember to mention the gold the PCs put into the pillar thing at Thistletop when they get to Xin-Shalast. Now I can only wait for the stats for those giants! OoOo! I need Karzoug's stats! And who is that dwarven avenger? God that's a great cover. By the gods, I'm not usually one to complain about WAR's work, but those swords are horrid abominations imo. Can't agree with the blog's "original but authentic" description. Forget the fact they're way to wide, what's with those rings? How would one sheathe such a sword? Certainly with them weighing as much as they must, you wouldn't expect someone to just carry them around unsheathed. I LOVE the giants, otoh. Nice work there. Gives a cultural feel different from the rest of the creatures we've encountered so far. That's all I can say. I love the look of these beasts and I can't wait to see them in action! I adore the cover. When I looked at the huge swords, the first thing I thought of was not about how they sheathed them. I was more interested in the overwhelming drama and allure of a great battle against a breathtaking backdrop. As far as sheaths go, I'd assume they'd have sheaths to hold such swords, and/or there are alternate means to keeping them around without always having to hold them. Perhaps the rings are an illusion that only appear when unsheathed. On another note, I am absolutely ecstatic to see the iconic Dwarf and to see him done well. In the background, it looks like there's another newcomer to the group as well (the one sporting the shield). I'm curious to get a closer glimpse to this new one as well. Forget the fact they're way too wide, what's with those rings? How would one sheathe such a sword? Certainly with them weighing as much as they must, you wouldn't expect someone to just carry them around unsheathed. I imagine WAR was basing them off of the Chinese nine rings sword (I want to say "ba gua" but I'm probably wrong), which, given the Xin-Shalast architecture in the background, is probably appropriate thematically. Any sword sheaths that they might carry would probably accommodate said rings in their design, probably leaving one side of the sheath open, with a cup or pocket for the tip of the blade and a securing strap near the hilt. Oh. They're also giants. I don't imagine they'd have difficulty carrying a broad blade. I imagine WAR was basing them off of the Chinese nine rings sword (I want to say "ba gua" but I'm probably wrong), which, given the Xin-Shalast architecture in the background, is probably appropriate thematically. I'm with Lilith on this, Reckless: it's clearly based on the historical Chinese swords, which also appear in wuxia films with some frequency. I've seen one at the Field Museum, I think. They're reasonably well known to students of Oriental weaponry. In the background, it looks like there's another newcomer to the group as well (the one sporting the shield). I'm curious to get a closer glimpse to this new one as well. She looks like Kyra to me, with the scimitar and blue/gold/white clothes. While her PF4 cover art shows no shield, she has one in her equipment. Yeah; these guys (they're new giants called Rune Giants) are going to have strength scores close to 40, I'm guessing. Big weapons like that aren't going to be a problem for them. And yes... the concept of rings in swords is indeed based on real life. There are swords like that in real life and from real world history. It's certainly tied in with the flavor and themes of Xin-Shalast, which has a heavy dose of Asia in its makeup (but also India and Europe and lots of other places... it doesn't really have an exact real world historical analoge). Very cool giant designs. I've heard talk about Pathfinder miniatures and you know what ... if Paizo made a couple of Rune Giants (male and female) armed and armored just like that cover ... well, damn. By the Gods how does one fight such beasts!!! Those giants are Gargantuan! A longsword wound would be like a pin prick on these bruisers. Love the underbite though... I immediately thought Ogre Magi crossed with Fire Giant samurai. A dwarf and his Crossbow... ah the iconicness of it. Swoon. It looks like a heavy crossbow, too. Sweet. I've been playing around with the thought of developing either a Combat Style (Crossbow) for the ranger and/or Dwarf Ranger substitution levels to make it easier for dwarf rangers to concentrate on "traditional" dwarven weapon choices (axes, crossbows, hammers, picks). Combat Style (Crossbow) would probably consist of Rapid Reload at 2nd, Crossbow Sniper at 6th, and Penetrating Shot at 11th. I'm still deciding what changes to make for the substitution levels. Racial Favored enemy at 1st and Toughness instead of Endurance at 3rd are easy choices (as well as upping HD to d10 for the substitution levels), but I'm still figuring out what other one ore two levels I want to change. "This is a classic and truly awe inspiring sword. The 9 rings were meant to disorientate and confuse the enemy. Imagine the sound of 1000 of these swords pounding on the warriors shields - amazing." Reminds me of the Mongolians with their whistling arrows, etc. I would imagine the rings would have some merit as mentioned. Any news on when this will ship? Will January be the double Pathfinder month? I suspect this will ship so late in January that it will probably arrive in mailboxes in February. The first supplement in Curse of the Crimson Throne is scheduled for March, so it would be odd of Paizo to leave a hole in their schedule for February. I had not noticed that PF7 had slipped... Bummer. We expect PF6 to arrive in the last days of January, and PF7 to arrive at the end of February. Ah Vic, Music to my ears. Excellent!!! After flying through #5 I'm ready to see #6. So, is Greg Vaughan now the go-to-guy for climactic high level modules? Any idea why my PF5 hasn't even shipped yet? Is there a reason why this issue of Pathfinder costs more then the other 4 issues for Charter Subscribers? I'm showing being billed 20 dollars before shipping and handling, when I normally am only paying 18 and that's after shipping and handling. This seems strange to me. I have no info about billing issues. I also cannot give specific arrival data for various zip codes and various foreign countries, because all the mail carriers have time windows as opposed to exact dates. So why is the warehouse monkey posting you ask? Well to let you know that I am safely tucking all your Pathfinder 6s into those adorable little envelopes. It appears that the great majority of them will be out the door by Friday. * ... and now back to the warehouse. *By great majority I mean those individuals who are not involved in monthly shipments or who have orders waiting on other items. I do have information about billing/shipping issues! Your Pathfinder #5 is currently waiting in your account sidecart for your monthly shipment. It should ship a little later this month. Your Pathfinder is being billed to you at the same subscriber rate, but you shipping does look like it's set at Priority Mail. If this isn't correct, please shoot us a quick email at customer.service@paizo.com.